If your house was on fire, would you be able to grab what you need and go? What about in an earthquake, hurricane, tornado or other emergency? Two years ago, we decided to have our kids prepare "go bags" that they would keep in their room in case of an emergency. Ironic as it is, we did not take them with us when we moved to Hawaii, and just a few weeks after moving there, we were hiding in a room because of the missile threat. It goes to show that you really never do know when you might need to get out as quickly as possible. Being prepared is a very comforting feeling. In today's video, we decided to give our go bags a major upgrade. All the kids got their own backpack, Matt and I got a family bag, and we even got some for our aunts and parents (shh, they don't know yet--it's a surprise!) The new bags are from Emergency Zone and they're fully loaded with all of the essentials from water to first aid to things to keep you occupied if you're away from home for a long time. We also updated our food storage by adding a bunch more food with a super long shelf life from Legacy Foods. We added some new things as well--a portable toilet made from a bucket and some go bags for our dogs! 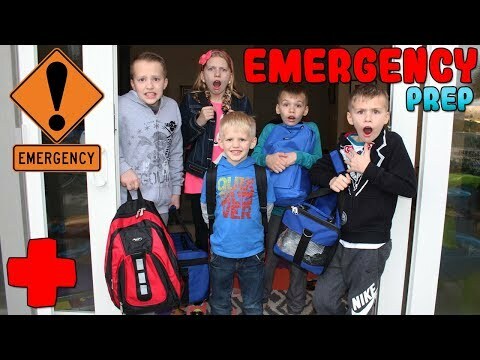 The other important part of today's video is that we practiced our evacuation process as a family. We went over our meeting spot and what to do in different types of emergencies. I think this helps the kids feel confident, if they ever were to have to use these skills. Be sure to tell us in the comments your tips and tricks that your family uses and let us know if you have any questions! We will answer them next week. I surprised my mom with a Mohawk! I Got INKED By an Octopus!! Escape the Babysitter! Babysitter Showdown! Escape the Room – Sneaky Mystery Clue Again!